Chad Greenway (born January 12, 1983) is an American football linebacker for the Minnesota Vikings of the National Football League (NFL). He played college football at Iowa, and was drafted by the Vikings in the first round of the 2006 NFL Draft. Chad Greenway entered the 2006 NFL Draft, where he was drafted by the Vikings with the 17th pick in the first round. Greenway selected #52 as his jersey number for the Minnesota Vikings. In training camp, he was listed as a second string linebacker on the depth chart. In Minnesota's first preseason game against Oakland, Greenway tore his ACL playing special teams on a kickoff return. He missed the entire 2006 NFL season with the injury. Greenway started the 2007 season as the Minnesota Vikings starting weakside linebacker. In Greenway's first NFL game on September 9, 2007 against the Atlanta Falcons Greenway recorded 10 tackles. Greenway completed the 2007 season with 105 tackles with two forced fumbles along with two interceptions with one touchdown. In 2008, Greenway had another impressive season finishing with 5.5 sacks and led the team with 115 tackles. He also deflected 5 passes. On February 21, 2011, the Vikings announced that Greenway was designated as their franchise player for 2011. 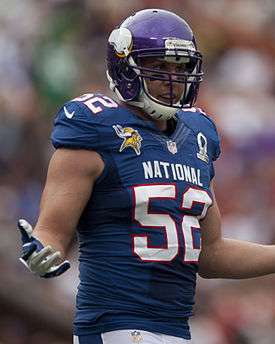 Greenway was selected to his first Pro Bowl after a career-high 154 tackles, 13 tackles for loss, 2 sacks and a fumble recovery during the 2011 season. On October 5, 2012, Greenway was fined $21,000 for unnecessary roughness. He struck Calvin Johnson in the head and neck area. Greenway married in July 2006 to Jennifer Capista, a former track and field athlete at Iowa. The couple had a daughter, Maddyn, in summer 2007. In the 2015 season, Greenway was named the Vikings' Community Man-of-the-Year for the second consecutive year. ↑ "Archived copy". Archived from the original on 2015-07-08. Retrieved 2015-03-08. ↑ "Vikings LB Greenway fined $21,000". Fox Sports. October 5, 2012. Retrieved October 6, 2012. ↑ "Chad Greenway Stats". ESPN. ESPN Internet Ventures. Retrieved 6 November 2016. ↑ "Chad Greenway's Lead the Way Foundation Home Page". Chad Greenway’s Lead The Way Foundation. Retrieved August 29, 2016. ↑ "Chad Greenway's Lead The Way Foundation | A Prolanthropy-Managed Organizaition". Retrieved 2016-08-29. ↑ "Greenway Hosts Over 200 Women at the 6th Annual TendHER Heart Brunch". Retrieved 2016-08-29. ↑ Patrick, Adam (2015-12-04). "Greenway's 2015 Impact Getting Noticed From Multiple Angles - Vikings Territory". Retrieved 2016-08-29. ↑ Young, Lindsey (2015-07-15). "Chad Greenway Impacts Childrens Hospital". Retrieved 2016-08-29. ↑ "Corporate Partners | Children's Hospitals and Clinics of Minnesota". Retrieved 2016-08-29. ↑ "Ronald McDonald House Charities - Upper Midwest". rmhtwincities.org. Retrieved 2016-08-29. ↑ "Chad's Locker". www.sanfordhealth.org. Retrieved 2016-08-29. ↑ "Greenway opens 7th 'Chad's Locker' to help hospital patients". Retrieved 2016-08-29. ↑ "Chad Greenway Repeats as Vikings Community Man of the Year". www.vikings.com. Retrieved 2015-12-03. ↑ "Chad Greenway is Vikings' nominee for Walter Payton Man of the Year". Star Tribune. Retrieved 2015-12-03.